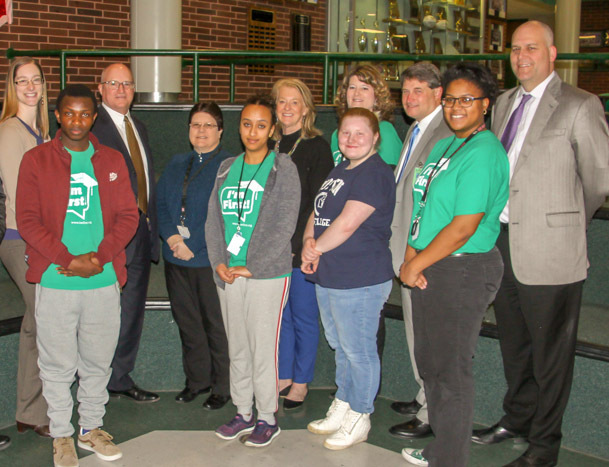 Several Pattonville High School seniors recently celebrated their participation in the Pattonville College Academy with a reception with business partners who helped financially support the program and provide sponsorships and scholarships. The academy gives first-generation, college-bound students support and knowledge about the college planning and search process. Each student who graduated from the College Academy received a $100 sponsorship from Pattonville's business partners. Pattonville also supplied funds for an annual scholarship for a College Academy participant. SeniorKyla Beckwon this $500 scholarship through a drawing of all participants. The Pattonville College Academy covered goal setting, college resume writing, how to compare colleges, how to start the college search, college admissions, scholarships, financial aid, letters of recommendation, essay-writing tips and ACT test-taking tips. On the final day of the academy, students visited area college campuses. Sponsors of the program were the city of Bridgeton, Commercial Bank, Fred Weber Inc., James Hutchison Forth and Snyder P.C., John Patterson from Jostens, Ranken Jordan Pediatric Hospital, SSM DePaul Health Center, US Bank and Westport Plaza. For more information about the College Academy or preparing for college, call Michelle Luraschi, college/career counselor, at (314) 213-8051. Several Pattonville College Academy graduates are shown with Pattonville staff and business partners who supported the program.